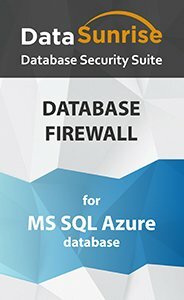 DataSunrise Firewall protects Azure SQL databases against attacks and prevents unauthorized access to sensitive information. Sophisticated SQL analysis algorithms with a set of pre-defined and customizable security policies enable to detect database attacks based on threat patterns and past incidents. Firewall evaluates factors like time, location, IP addresses, type of application and builds a list of approved and potentially harmful SQL statements. DataSunrise Database Firewall for Azure SQL is a reliable and convenient-to-use security solution for preventing cyberattacks and fraudulent insider activity. Functioning as a proxy between database and users, DataSunrise controls all the queries and database responses and blocks them if they violate security policy. Firewall analyzes incoming SQL commands and creates a whitelist of statements typical for given environment. All the queries are compared with the whitelist, other security rules and only those that comply with security policies are sent to the database. DataSunrise protects from different types of SQL injections (Boolean exploitation, out-of-band exploitation, time delay technique, automated exploitation, Union exploitation). DataSunrise is an efficient access management tool. Privileged user access can be controlled or restricted to certain parts of a database. There is an opportunity to prevent sharing accounts for database access. Rule settings allow to set firewall to block queries with certain type or name of the target database, tables or columns; queries containing certain signs of SQL injection, queries came from certain IP address or client application; queries of certain SQL statement. Events Section provides visibility of all cases when certain security rule was triggered. Also, you can add an email address in order to receive notifications of certain policy violation, so that you can timely react to attack attempts or unauthorized actions of employees. All functions of DataSunrise are controlled via a user-friendly graphical interface with a set of customizable settings to automate security processes. Deployment process of the firewall is performed in several simple steps. It doesn’t require any additional applications. There is an ability to switch to sniffer mode, where DataSunrise will perform only audit functions. In a proxy-mode firewall has almost no impact on database performance. DataSunrise Database Firewall is an effective security tool that acts as an intermediary between a database and its users protecting integrity and confidentiality of corporate sensitive data on Azure SQL.